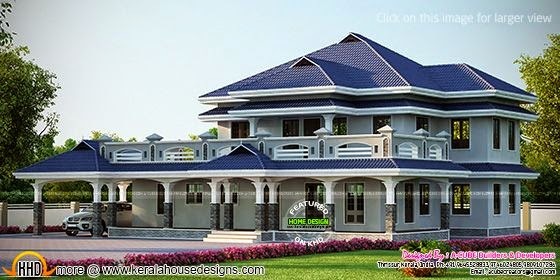 This is a wonderful looking luxury house. The total area of this sloping roof style house is 3268 Square Feet (304 Square Meter) (363 Square Yards) and having 4 bedrooms in two floors. All 4 bedrooms in this house having attached bathroom facility and one common toilet . Designed by A-CUBE Builders & Developers, Thrissur, Kerala. Ground floor : 1983 Sq.Ft. Total area : 3268 Sq.Ft.